The Listeria monocytogenes outbreak linked to commercially prepared, prepackaged caramel apple outbreak is scary. Most people wouldn’t associate such a product with bacteria contamination, but apples, like every other fruit or vegetable, can carry pathogenic bacteria. Here’s what you need to know to protect yourself. According to the CDC, there are 32 people who have been sickened by this outbreak. They live in 11 states: Arizona (4), California (2), Minnesota (4), Missouri (5), Nevada (1), New Mexico (6), North Carolina (1), Texas (4), Utah (1), Washington (1), and Wisconsin (3). Of the 32 people sickened, 31 have been hospitalized. Six people have died in this outbreak, and three children have developed Listeria meningitis, a serious complication of this infection. Ten of the illnesses are pregnancy related; one woman suffered a fetal loss. Two people in Canada are sick with the same outbreak strain of bacteria. Public health officials use multipliers to estimate the number of people sickened in each outbreak. Many illnesses in each outbreak are not reported to the government. For some illnesses, such as Salmonella, that multiplier is very high, at 30.3. For Listeria infections, the multiplier is only 2, since these infections tend to be severe and require medical care. That means there may be as many as 64 people sickened in this outbreak. 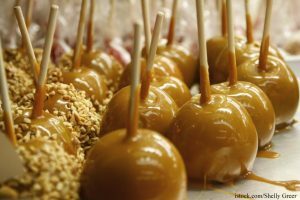 There have been three recalls for commercially produced caramel apples related to this outbreak. Happy Apples recalled their products on Christmas Eve 2014. California Snack Foods recalled Karm’l Dapples last week. And Merb’s Candies recalled Bionic Apples and Double Dipped Apples this week. Bidart Brothers recalled their apples that were supplied to two of these companies, and Pacific Coast Fruit said their apples may be associated with this outbreak. In Minnesota, Carnival and Kitchen Cravings brands are associated with the outbreak in that state. The FDA is also investigating common sources of caramel, caramel ingredients, sticks, or packaging sold to these caramel apple makers. The government is warning consumers not to eat any commercially prepared, prepackaged caramel apples until further notice. More brands may be recalled as the investigation progresses. The products are seasonal, and shouldn’t be available on store shelves. The last caramel apples were produced in late November. Because the products have a shelf life of about a month, some consumers may have them in their homes. If you did purchase any commercially prepared caramel apple product this fall, discard it in a closed container or return to the place of purchase for a refund. Then wash your hands thoroughly with soap and warm water. Clean the area where the apples were stored with a mild bleach solution to kill any bacteria. Also clean the refrigerator if you kept the apples there, since Listeria bacteria can grow at refrigerator temperatures, and the longer foods are stored in the fridge, the more opportunity Listeria bacteria have to grow. If you ate a commercially prepared caramel apple this fall, don’t panic. Just mark on a calendar the date or approximate date that you ate one, and watch yourself for the symptoms of listeriosis for 70 days from that date. Those symptoms include high fever, stiff neck, severe headache, nausea, stomach cramps, and diarrhea. Pregnant women are especially susceptible to this bacteria. They may only have a mild flu-like illness, but listeriosis can cause miscarriage, stillbirth, and infection in the newborn. If you do get sick, see your doctor right away for treatment. I wonder why only caramel apples? What about the same apples that were used/distributed for non-caramel preparation?